your first two choices to cart and return to this page to order more. The brilliance of gold, silver or copper metallic foil adds the value of precious metals to your designs! 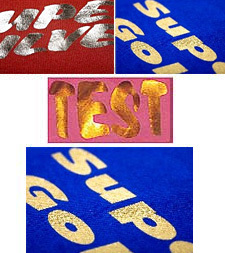 You can also use these foils in conjunction with ThermoFlex® films for brilliant accent or contrast. These films have a reflective metal foil appearance and have a soft hand. They also show the texture of the attached fabric!